Early Warning. In the foreground a peaceful scene. In the background, three symbols of the nuclear age. 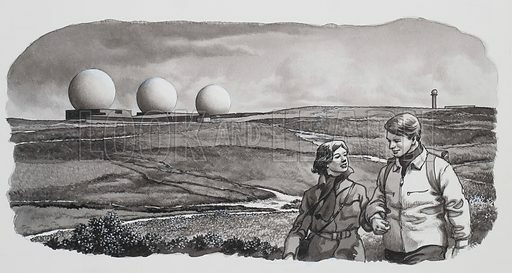 They are the three radomes of the Ballistic Missle Early Warning Station on Fylingdales Moor. Original artwork for illustration on p4 of Look and Learn issue no 481 (3 April 1971). Available worldwide for immediate download up to 5,475 x 2,922 pixels.